A Detailed Look Into The Online Portal. Global Banking and Finance Review is a leading Online and Print Magazine, which has evolved from the growing need to have a more balanced view, for informative and independent news within the financial community. Our experienced contributors provide this quality and in-depth insight in a clear and concise way, providing leading players and key figures with up to date information within the finance sector. Read in over 200 different countries. Our readership includes Presidents, CEO’s, CFO’S and Senior Decision makers within Fortune 500 companies, Major Banks, Financial Institutions, Central Banks, Traders, and Individuals interested in the business and financial markets and news. Experienced industry journalists providing up to the minute coverage on Banking, Foreign Exchange, Brokerage, Funds, Islamic Finance, Wealth Management, Corporate Governance, Project Finance, Merger and Acquisitions, Tax and Accounting, Inward Investment and C.S.R. Activities; all under one global umbrella. Latest Market News, Videos as they happen, Global Market Overviews, Articles, Analysis & Resources. Global Banking and Finance Review brings together the entire fundamental and growth areas of finance and banking into one easy platform, with a vast reach, the portal offers some unique ways to reach the global audience to help you enhance your brand value. 3,356,759 visitors to our website with 3,336,661 Unique Visitors count. Overall reach of 100,000+ Readers per issue across 175 countries. 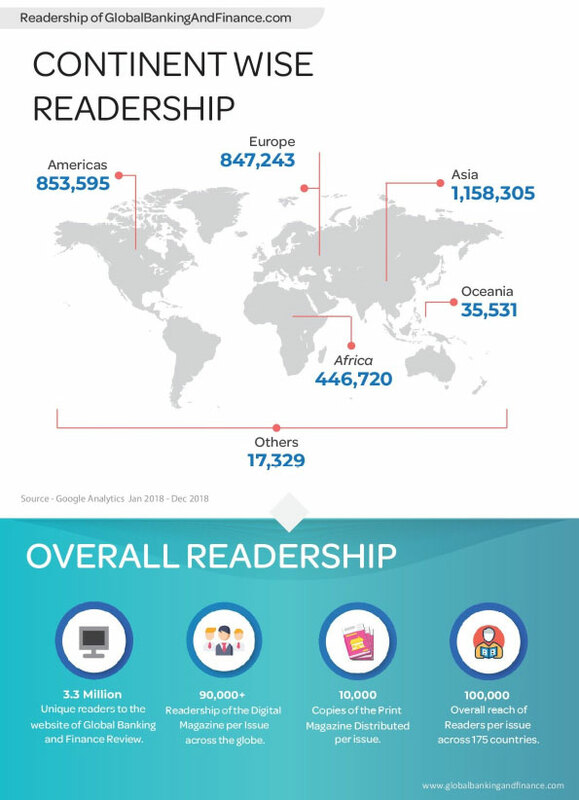 90,000+ Readership of the Digital Magazine per Issue across the globe.